I am trying to map menu items on media library. My expectation was that I should all the categories separate such as books, music and map them on separate items. When I try to choose the type of the menu item the Media libarary type shows "category" and then another "category" without the breakdown of different categories as shown below. Please advise how I can fix this problem. Sorry not understand what you means: When I try to choose the type of the menu item the Media library type shows "category" and then another "category"
How you try do that ? Do you try use XMAp components for that ? Do you try user ours plugin for that component ? 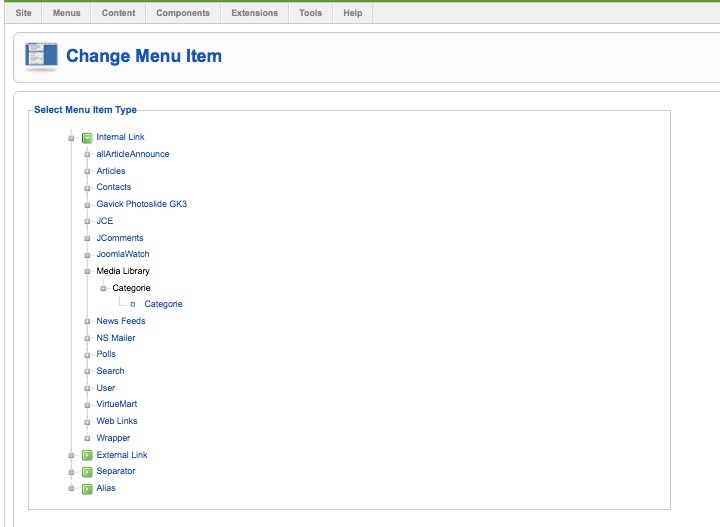 I am just using Menu option in Joomla. I have defined a new menu called Video and I want to define its type based on Medialibrary-music category. But the categories of Media library are not seen in options. I hope I am clear this time. I am attaching the screen dump. Last Edit: 2010/10/13 07:52 By .